Today in Masonic History Louis Burt Mayer is Born in 1884. Louis Burt Mayer was an American film producer. Mayer was born Lazar Meir in Minsk, Russian Empire. The actual date of his birthday is questioned, though most sources have it as July 12, 1884. In 1887, Mayer moved with his family to Rhode Island, then to Saint John, New Brunswick, Canada. In Canada, Mayer's father who had little education and a limited set of skills open a scrap metal business. At the age of 12, Mayer quit school to help the family business. He would teach himself manners and social schools, as well as academics. In 1904, Mayer left St. John and moved to Boston. There he would reopen a burlesque house with 600 seats in Haverhill, Massachusetts. He would rename the theatre the Orpheum and it would become his first movie theatre. Within a few years he would owned all 5 of Haverhill's theaters. Through a partnership he would eventually own the biggest chain of theaters in New England. In 1917, Mayer moved to Los Angeles, California. 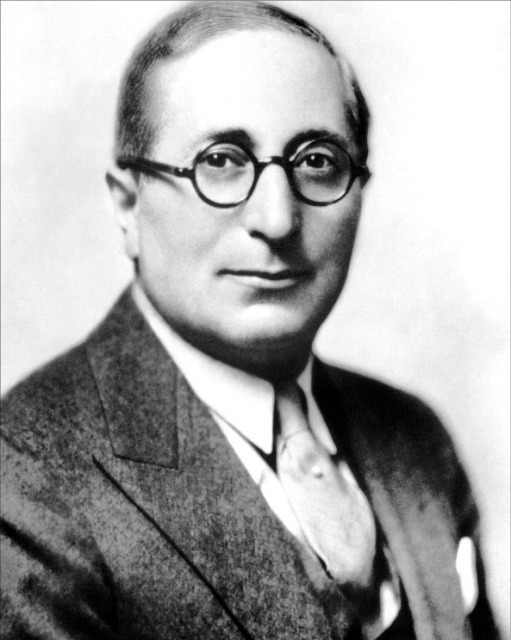 There he would open Louis B. Mayer Pictures Corporation. A few years later he would merge with another studio making the the Mayer-Schulberg Studio. In 1924, Mayer's big opportunity would come when Marcus Loew, who owned the Loew's chain of theaters would merge with Mayer's studio. They initial form Metro-Goldwyn. Mayer was given full control of the theatre and a few years later would rename the theatre Metro-Goldwyn Mayer (MGM), with Loews consent. MGM would thrive under Mayer. In the early days Mayer had met a young and upcoming producer, Irving Thalberg. The two complemented each other in the management of the studio, where Mayer wanted the crowd pleasing movies, Thalberg looked for substance in the projects the studio produced. Mayer saw Thalberg as something of a son. Despite the relationship the two men had, Mayer would eventually replace Thalberg as the production chief of the studio. Shortly after Thalberg would pass away from a heart attack. Many felt that would be the end of the studio. MGM continued to thrive without Thalberg. After Thalberg's passing Mayer would put out historic movies including Gone with the Wind and The Wizard of Oz. When the war in Europe began, many in Hollywood, including Mayer, were concerned that the 40% of a movies revenue, which came from Europe, would be taken away if Nazi censors did not like a film. Despite that fear, Mayer made several films with anti-Nazi and pro-British themes. In 1942, Mayer released the film Mrs. Miniver, a story of a woman keeping her family together and surviving during the London blitz. The film would receive 7 academy awards, including a best actress Oscar for the star of the film. Even President Roosevelt and Winston Churchill were fans of the film. Churchill even sent Mayer a telegram stating that the film was propaganda worth 100 battleships. After the war, MGM began to slide and Mayer would struggle in his position as the studio head. Mayer would pass away from Leukemia on October 29th, 1957. Mayer was a member of St. Cecile Lodge No. 568, in New York City, New York.